350.org was founded by a group of university friends in the U.S. along with author Bill McKibben, who wrote one of the first books on global warming for the general public. The number 350 means climate safety: to preserve a livable planet, scientists tell us we must reduce the amount of CO2 in the atmosphere from its current level of 400 parts per million to below 350 ppm. 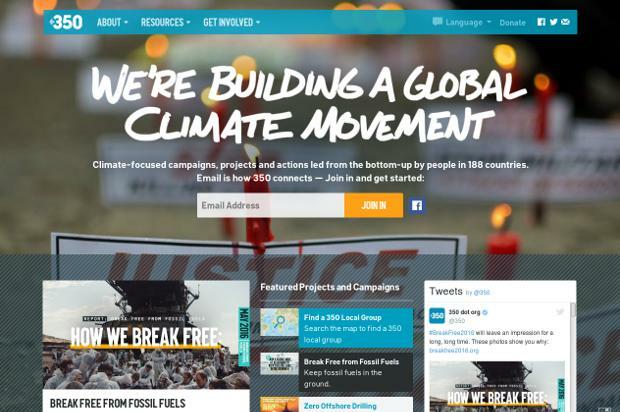 Today, 350.org works in almost every country in the world on campaigns like fighting coal power plants in India, stopping the Keystone XL pipeline in the U.S, and divesting public institutions everywhere from fossil fuels. All of their work leverages people power to dismantle the influence and infrastructure of the fossil fuel industry, and to develop people-centric solutions to the climate crisis. Their online campaigns, grassroots organizing, and mass public actions are coordinated by a global network active in over 188 countries.